Welcome to The Painted Lady - Bed & Breakfast and Event Venue. 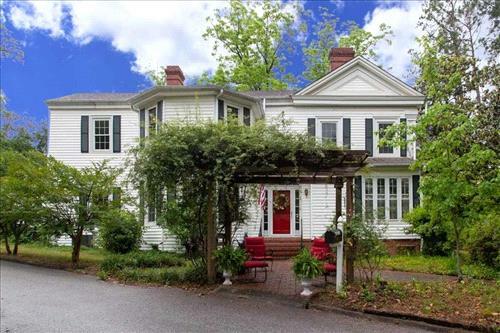 This is a historic 4 BD/2 BA home located in the Historic District of downtown Augusta. You'll love the accommodations, the ambiance, the spacious guest rooms that are individually decorated, and the social and living areas of this historic home. Come enjoy Sunday Brunch the 2nd Sunday of every month, prepared by accomplished Chef Leo. Join them here for a wonderful lodging experience and many special events. It's a wonderful venue for parties, dinners, meetings, wedding events, bridal showers, girlfriend get-togethers, just to name a few. Check out The Painted Lady Facebook page for all the happenings. Call Valerie for reservations & rates. Taxes & tip paid in cash. On 2015-04-29 15:20, Cherity Robinson wrote: I wanted to thank you for hosting the meeting last night and welcoming us into your home/business. The house is absolutely beautiful. I have family in Florida that visits often so I will recommend them to stay at The Painted Lady the next time they come into town. Also, I would like to give a shout-out to Chef Leo. The food was amazing. Does he cater other events as well? Jay Jenkins — 5 star Great food & southern hospitality. I would highly recommend that if you are visiting Augusta or just passing through, this is the place to stop, relax, and get your Grubb on. Leo Ranks — 5 star Simply amazing! Good atmosphere, awesome people! The interior decor is unique, it offers this warmth home away from home feeling that makes it easy to relax. Extra large rooms, southern hospitality, (friendly) service!